Want to display Portfolio Post Type items in Masonry style in Genesis? In this article I share the code for using Masonry (built into WP) on Portfolio CPT Archive page and Portfolio taxonomy archives on non-handhelds. On tablets and mobiles, :nth-of-type pseudo selector will be used for displaying the entries in a grid with the number of columns depending on viewport widths. Install and activate Portfolio Post Type plugin. This will register a portfolio Custom Post Type with a corresponding portfolio_category and portfolio_tag custom taxonomies. 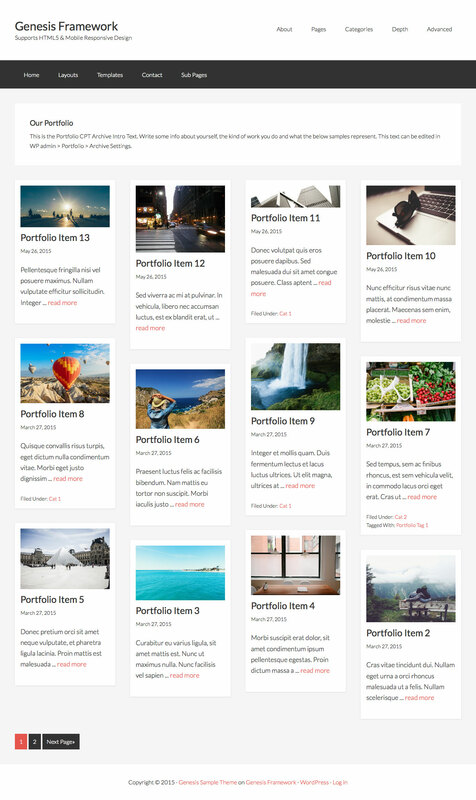 Add your Portfolio entries while setting a featured image for each. Images of varying sizes make the best impact for the masonry display. Thanks for the tuturial, it’s great! I would like to use this with Easy Content Types (by pippins plugins), instead of the Portfolio Post Type plugin, is that possible? And is it possible on a page with a right sidebar? Are you going to register and use custom taxonomies with that plugin? You also need to adjust the width of .masonry-page .content .entry. Thanks for your prompt reply. I am still in a testing phase and I don’t know yet if I will need to use taxonomies. The purpose is to show the custom post types to replace this: http://www.xanderuitgevers.nl/, with more or less the same look and feel. Hope that’s possible. Just change no. of columns? Thank you very much for the tutorial, I really appreciate it! I’ve applied it and it works well. I’m only having trouble with the media queries, they seem to display the images like a stair case, or they don’t have a padding between entries. Not sure if I am also the only one experiencing trouble. I want to be able to reorder the portfolio using the Simple Page Ordering plugins. I’m not sure but where do I add the following code in the functions.php? look at the functions.php file line 18. @256studio I added the code to line 18 of the function.php and it does not work. Can you help me understand the formula? x is the width of each masonry block (.masonry-page .content .entry). It depends on how many columns you want, what your desired horizontal gap between blocks is and the width of blocks’ container. I use Soulver to calculate this. See http://d.pr/i/1g7wK. first of all really great tutorials! I’ve used this and it works perfekt. Currently I use the Altitude-Pro childtheme. And I want to add this “Archive”-Page into one of the Front Page Widget Areas. First I thought of writing a Widget that pulls all the posts like this Archive-Page and insert that Widget in the designated Widget Area on Front Page. How can I do this? Is there a way to include that Archive Portfolio Page? The Website will be a onepager, after a Slider(Front Page 1) this kind of Blogroll comes with the Portfolio-Items displayed in Masonry-Style like this tutorial (Front Page 2). Later there will be some functionality added like a “Load More” Button (to display more Portfolio-Items and stay on same Page (Onepage)). Another functionality will be an ordering function that allows the user to click a tag/category link under the Posts (where it says Filed under) and that section will only show the posts under this category (but still on same page because the Onepager). Is there a way to add this style here on to the get_posts results? Is there a way I can tell wordpress to use the template for get_posts? Like get_posts_template(‘archive-portfolio’)? I don’t know why but my portfoio category loads the template index.php instead of the archive-portfolio template ? Have you any recommandation ? FYI Demo is dead but great tutorial! Thanks. I have removed the dead link.